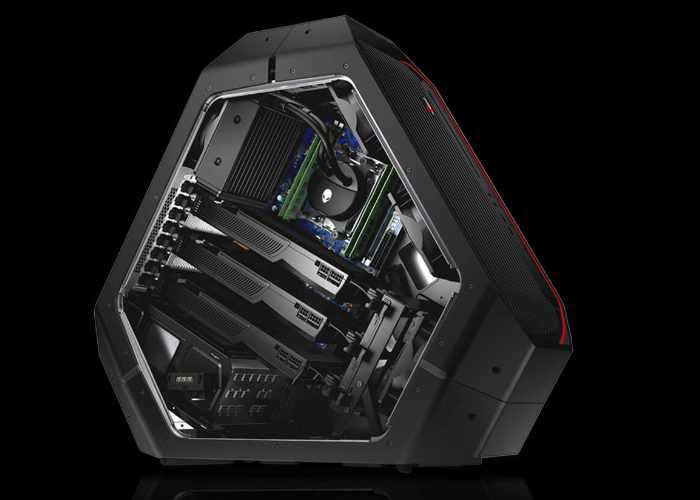 At E3 this week Alienware and Dell have unveiled two new versions of the Alienware Area-51 desktop PC which are now equipped with by Intel Core X-Series and AMD Ryzen Threadripper processors depending on your preference. The addition of the new processes has allowed Alienware to create its first 16-core/32-thread Area-51 desktop gaming PC. Other new products that were unveiled during this year’s E3 2017 included a new gaming monitor which we featured earlier this week with a 1 ms panel response time together with advanced and pro gaming keyboards and mice. The Area 51 Threadripper Edition will be available to order on July 27th and the Area 51 featuring Intel Core X-Series will arrive on August 22nd 2017. No information on pricing has been released as yet Dell, but as soon as information comes to light we will keep you updated as always. – Monitors – The Alienware 25″ gaming monitor, with either NVIDIA G-SYNC (AW2518H) or AMD FreeSync, (AW2518HF), offers fast, responsive gameplay with virtually no input lag, at an extremely rapid 1 ms panel response time, and a native 240Hz refresh rate. With three preset display modes, full adjustability, single-diecast stand legs, and a seamless panoramic multi-monitor view with ultra-thin bezel in 1920×1080 resolution, the Alienware 25″ gaming monitor is perfect for any gamer. Available in the U.S. June 13, concurrent with E3: monitors ($499-699 USD). – Alienware Advanced Gaming Keyboard – Blending gamer-friendly design features and intuitive software, the Alienware Advanced Gaming Keyboard with optional palm rest delivers a premium gaming experience at an affordable value. Featuring mechanical keys with brown switches, with more precise, responsive and consistent key strokes with five keys dedicated for macro commands that give gamers a competitive edge. Personalizing the gaming experience, Alienware’s sophisticated software, Alienware Control Center, allows gamers the ability to configure all keys to desired commands. Available in the U.S. June 13, concurrent with E3: Advanced Gaming Keyboard ($89.99 USD). – Alienware Pro Gaming Keyboard – Amplifying the gaming experience, the Alienware Pro Gaming Keyboard with optional palm rest exemplifies all the essential design components of the Advanced Gaming Keyboard, and elevates the engineering innovation with dedicated volume roller and 13 zone-based RGB AlienFX backlit lighting options. A key stroke can mean the difference between winning and losing, and onboard memory adds a new level of intelligent options for assigning key stroke combinations ultimately increasing efficiency to command and conquer opponents. Available in the U.S. June 13, concurrent with E3: Pro Gaming Keyboard ($119.99 USD). – Alienware Advanced Gaming Mouse – Fusing ergonomic design for increased comfort and intelligent software with gaming-grade performance, the Alienware Advanced Gaming Mouse offers multiple configurations with on-the-fly DPI to switch between precision and speed style gameplay. Outfitted with nine unique buttons for in-game customization. Available in the U.S June 13, concurrent with E3: Advanced Gaming Mouse ($49.99 USD). – Alienware Elite Gaming Mouse – Further enhancing the premium gaming experience, Alienware Elite Gaming Mouse incorporates all the game-ready innovation of its capable sibling, and leverages advanced custom ability innovation with swappable grips, up to 13 programmable buttons, perfect for MMOs like World of Warcraft and four variable levels of weight adjustment providing ultimate control over cursor precision and movement speed to dominate opponents. Available in the U.S. June 13, concurrent with E3: Advanced Gaming Mouse ($89.99 USD).